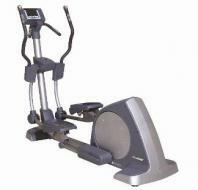 Elliptical Cross Trainers. M-707 Elliptical Cross Trainers New 8.9 EL Elliptical Cross Trainers is Commercial exercise machine that simulates number of aerobics exercises , including walking or running and many more. These Elliptical trainers decrease the risk of joint-related injuries. · Fly Wheel: 12kgs, 3 pcs Crank. · Meter: SR8260-7,2 Color LCD/ Back Light. · Display Scan, Speed, Time, Distance, Calories, Pulse, Recovery, RPM, Manual Watt, H.R.C., User Profiles, 12 Programs, Cap Switch. · Max User's Weight: 160 kgs. · Assembly Size: 2190*690*1880 MM. · Packing: 1 Set/CTN/114/114 Kgs/ 47 CU'FT.